SmartChartz helps to teach children consequences in the form of a reward system with a chart & stickers – good behaviour is rewarded with treats and prizes, whereas bad behaviour isn’t. Abiola, inventor of SmartChartz, realised her idea could have mass-market appeal and approached Enterprise Enfield for help in developing the product and setting up her business, SmartChartz Republic Ltd. Since then, Abiola has diversified into offering training and development courses for teachers and employers as well, by forming a Consultancy side of the business. The initial business model was based on producing and delivering SmartChartz products to market. This model has now been adapted to provide consultancy services on behaviour modification and group motivation to schools, parents and businesses interested in developing children and staff towards planned outcomes. Abiola’s Consultancy has trained teachers in the London Boroughs of; Barnet, Lambeth, Merton, Sutton, Croydon and The Royal Borough of Kingston Upon Thames and has also delivered training to various business networks. The Main Achievements the business has had would be in the area of product development, market expansion and in diversification. The ability to think and respond flexibly in the face of unexpected demands has been crucial to the success of the business. The fact that the business is adaptable has enabled it to respond to differing market demands and still come out ‘on top’. To date, 4 SmartChartz themed editions have been developed: Space, Pop Chicks, Toy and Dinosaur. SmartChartz are now available in 14 stores nationwide including Selfridges Oxford Street, Bentalls, Fenwicks and in Scotland, Wales, Newcastle, Manchester and Cheshire. 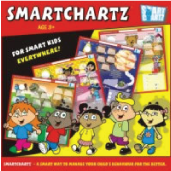 SmartChartz are routinely sold to Europe via online orders. 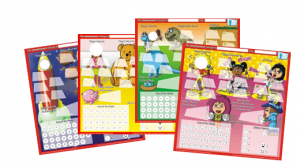 Teachers and Psychiatrists have approached Abiola about making SmartChartz products for classroom use and for patients with mental health patients. Semi-Finalist in the 2005 Government backed Trading Places Award. SmartChartz has also been promoted at many exhibitions including: Baby/ Child Fair- NEC, Baby Show Olympia – London and Toy Fair – London. When the business began Abiola really didn’t know how best to turn her idea into a product and also how to get her product to market. However, through the advice given by Chrystelle Benkhelil, Business Advisor and business training she obtained from Enfield Enterprise Agency and her sheer perseverance, strength of character and the ability to speak to absolutely anyone, Abiola was able to produce a world class product, which has been sold both nationally across the UK and internationally in places as far away as The USA. In terms of being able to turn an idea into a physical product Abiola is of the view that ‘you need to be able to identify actions (small steps) which will take you from a to z and learn from the mistakes made along the way. One of Abiola’s mistakes was to spend too much on exhibiting at Trade Exhibitions which weren’t directly related to her market for example the ; Toy Fair and Baby Shows rather than focusing on exhibitions for the Educational Market. SmartChartz products are an improvement on existing products or concepts, in this genre, in that they provide a ‘Learning Style’ based solution to accommodate the preferred learning styles of children. All the tasks and rewards are depicted with visual images which demonstrate clearly what a child should do or not do. SmartChartz tools are essentially able to teach children effectively with the use of all three learning styles; visual, audio and kinaesthetic. In addition the products are innovative in that they are set up so that the child drives the attainment of the outcomes agreed – ensuring that they (the child) has a sense of ownership of the result. SmartChartz products have been available in the UK since September 2004. 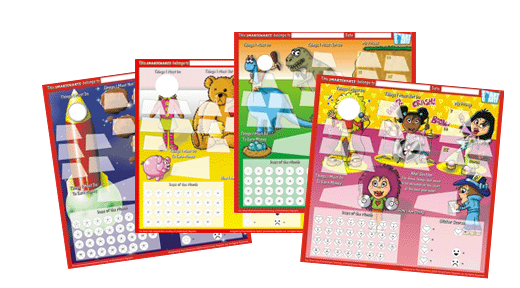 Due to repeated requests SmartChartz classroom products will be developed and manufactured for distribution to schools and nurseries in the UK and Europe for September 2008. SmartChartz training and consultancy services will continue to support the use of SmartChartz products for home and classroom use. SmartChartz, as a solution for managing children’s behaviour – provides parents and teachers with an effective tool with which they can motivate and manage their children’s behaviours positively. SmartChartz tools essentially teach children the benefits of working for rewards and ultimately help in the development of good citizenship behaviour in adults of the future. Abiola has provided inspirational business development talks to various business and Women’s forums including; Mayor of London’s Annual London Conference for Women, London Coaching Circle, North London Chamber of Commerce, Business Link’s Afro Caribbean Network, Enterprise Enfield and various school Parent Teacher Association events. Abiola has also taught teachers across London and the South East about effective classroom behaviour management techniques. These courses are to be rolled out across the midlands from March 2008.